Copyright © 2009-2014 GottaLoveMom CJ Solutions, Inc.. Powered by Blogger. To the American beside me who said it felt like a U2 concert, it’s only" Parokya ni Edgar", honey! On my family’s first visit to the Philippines 10 years ago, my children had their first exposure to Original Pilipino Music (OPM) through the songs of Parokya ni Edgar. So when I heard that Parokya ni Edgar was playing in Jersey City, I grabbed the chance to obtain free tickets for me and my husband. Sadly, the kids, with all their activities, could not join us. Craig and I arrived at the venue half an hour before the concert door was to open and there was already a long line of multi-generational Filipino Americans snaking around the theatre. We learned some of the fans travelled all the way from Connecticut and remote parts of New Jersey bordering Philly. And of course, the people from New York were well represented. I felt like I was in Manila all over again because of this air of giddiness all around. It’s like every Filipino within a 2-mile radius of The Landmark Loew’s Theatre was excited to be there. I met Jason Purino, the concert’s event organizer, and we spoke briefly. The concert is a celebration of Parokya’s staying power in the Philippine music industry, he said. “The band has been in the industry for more than 21 years! The longevity of them being in the industry for so long, and people still swarm in to watch their concert (is amazing),” he gushed. Backstage, I had a brief conversation with Dindin Moreno, the drummer, who has been friends with Parokya founder and lead singer, Chito Miranda, since he was 6 years old. “As much as possible, we want to cater to all the Filipinos in every corner of the world. We toured a lot in the Philippines – in the provinces, schools, cities. We also toured in the Middle East, in Qatar,” he replied when asked what the concert was about. Six FilAm bands, reminiscent of my son’s Battle of the Bands’ gigs, opened the show. The first, “Take The Stage,” energized the crowd. Their lead singer had this amazing voice and energy. He was also multi-talented, playing the keyboard, drums and engaged the crowd by jumping from one end of the stage to the other that looked like he was on an invisible skateboard. Another band, the “Rock by Babies,” was the best of all of them. They rendered classic rock songs. Their 12-year-old drummer was a hit! If your eyes were closed, you’d think he’s 25 by his masterful percussion performance. 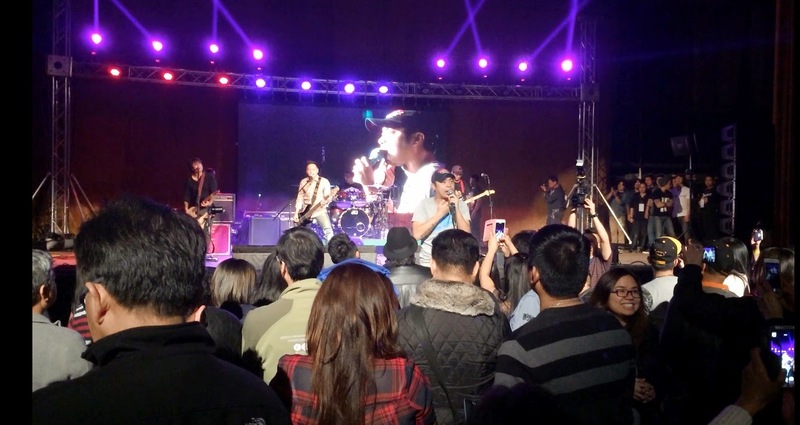 It was almost 10 p.m., or three hours after the doors opened, when Parokya ni Edgar went on stage. All hell broke loose! All cell phones started snapping photos! Craig commented on how “nice Filipinos were” for being patient. The members of the band — Chito Miranda (founding member and lead singer), Buwi Meneses (bassist) , Vinci Montaner (vocalist), Darius Semana (lead guitarist), Gab Chee Kee (founding member, guitarist), and Dindin Moreno (drummer) — played a superb set of OPMs. They’re super tight, every note in perfection. Chito was the stand-up comic. He engaged the audience with every song, encouraging the crowd to sing along and to those who didn’t know the lyrics, to just lip-sync. Wearing a baseball hat and a Nike shirt, Chito reminded me of my youngest brother. He thanked the audience for enjoying their songs adding how much the crowd’s appreciation meant to the band. The enthusiastic fans, knew every lyrics and were all moving towards the stage to take pictures. I looked around and the theatre was packed! There were probably over 2,000 people – all standing, taking selfies with the band behind them. I saw a friend, Carol Joyce Pena, one of MakilalaTV’s guest co-hosts and owner of Philippine Island Cuisine Catering and Event Planning. I asked her what she thought of the show. “I was truly starstruck watching them. It brought me back to my college days with my friends. I felt so excited watching them live on stage and dancing to their hits!” she said. After their hit show in Jersey City, Parokya ni Edgar was back on the road again – headed for Boston. As published in The FilAm.net . IsaBody Challenge. Transform Your Body. Transform Your Life. Saying NO to Yoga Pants? GottaLoveMom. 2017. All Rights Reserved.